GY1 Virtuoso Tradition, WY1 Virtouso Folk (each shown alongside endorsers Jerry Garcia and Bob Weir), DY50N Wind River Deluxe, DY52 Canyon Creek(Coral Rosewood), DY53N Canyon Creek (European Jumbo), DY80 Canyon Creek (with direct coupled bridge), DY38 Wood Ridge Mahogany, DY45 Vintage Dreadnought, DY74 Wellington Rosewood, DY74C Wellington Rosewood Cutaway, DY90 Deluxe Abalone, DY75 Lexington with Direct Coupled Bridge, DY92 Lute Back, DY77N Herringbone Dreadnought, DY61 Signature Standard, DY62 Signature Cutaway Bi-Phonic, DY72 Signature Mahogany 12 String,CY116, CY118 Jacaranda Classic, CY127CE Electric Classic, CY140 Grand Concert Master, DY87TB Express, DY8712VS Express Twelve and DY88BKN Express Pro. 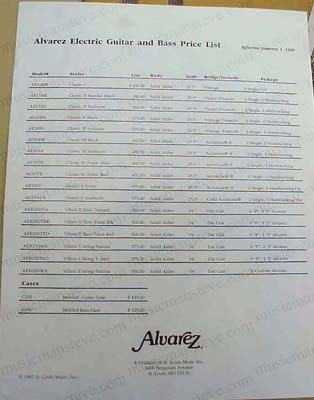 A 2-page 8 1/2" x 11" dated 1995 ALVAREZ price list for Alvarez Acoustic Instruments , banjo and mandolin. 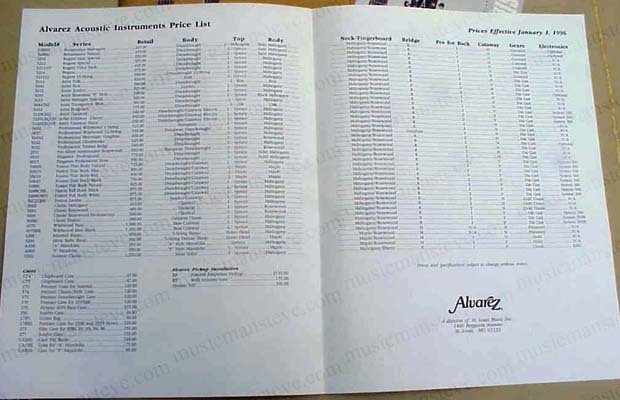 This pricelist does not accompany the above Alvarez Yairi Catalog but instead lists prices for all the 5000 series guitars, minstrel banjo and mandolins as well as cases. 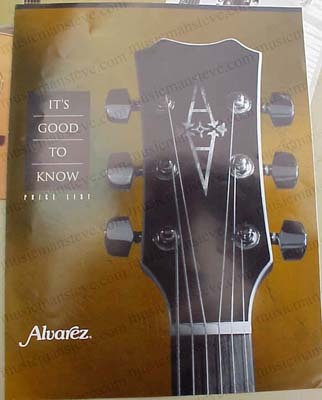 an undated 5" x 10 1/2" ALVAREZ Silver Anniversary brochure. 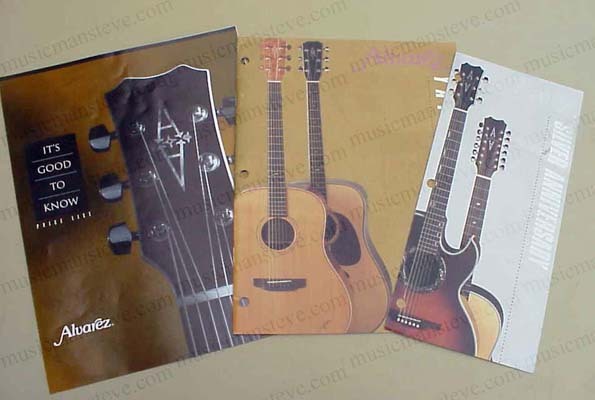 This is a single piece of stock folded to produce six 5" x 10 1/2" panels featuring the Silver Anniversary Rosewood 2551, 2551-12, 2552, 2555 and 2555S (sunburst). This is hole punched as well. This rare original full color catalog shows and describes all the lovely vintage Yairi guitars available at the time. OVERSEAS price is $30.00 plus $15.99 postage. For direct Paypal payment (overseas)...just hit the "PayPal Payments" button below.